Black bears emerge from their wintery sleep in early spring but do not become very active until the weather starts to warm up. For this reason, we do not book any hunters until later in the month of May. We have approximately 30 active baits in the zones we hunt in. They are spaced apart far enough so as to provide each hunter with a fair chance to take home a bear. In 2007, we did a promotional hunt, with twenty-one hunters and had a 100% success rate. Several large bears were taken, the largest being 300 pounds. We take only six hunters per week to ensure you receive the best chance possible to bag a trophy. Our guide ratio is two hunters per one professional guide. Unless we feel it is necessary, we harvest only one bear per season from each stand. Same as above with the exception of hunting in different locations and other baiting techniques. Note: If you are a first time hunter we can e-mail or mail you a list of what to bring. 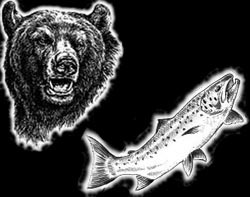 Please contact us for information on obtaining a bear license. New Brunswick has a growing population of moose. Licenses are issued by the zone as to control the number of harvested moose in each section of the province. The season is always the last Thursday, Friday and Saturday of September that does not run in to the month of October. Non-residents can choose what zone they would like to hunt after they have been successful in the draw. 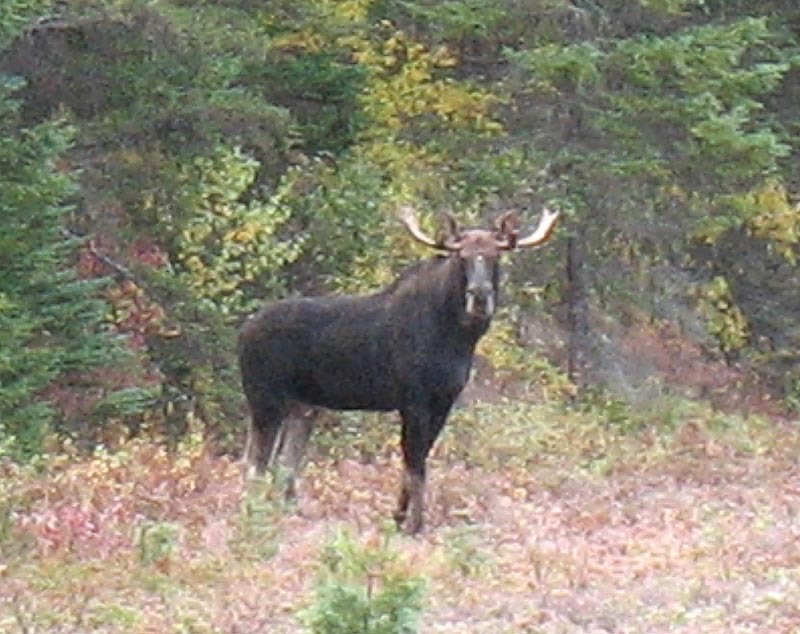 Hunting can be done from a permanent or portable tree stand where the moose feed or bed, or by randomly checking areas where the big bulls might be hanging out. Our guides are also excellent in bringing bulls to the call. Non-fundable fee of $39.55 CDN funds (charged to credit card). Apply on line or call toll-free 1-800-994-2666. Results will be available May 19 - June 12 2018 - 1-800-994-2666. The Moose Hunt was a complete success - Dale Hallstrom from Moosup CT. USA, downed a 600 pound bull on the first day of the hunt. Note: If you are a first-time hunter we can e-mail or mail you a list of what to bring. Please contact us for information on how to obtain a moose license in New Brunswick. The deadline for non-resident applications is April 30th of each year. 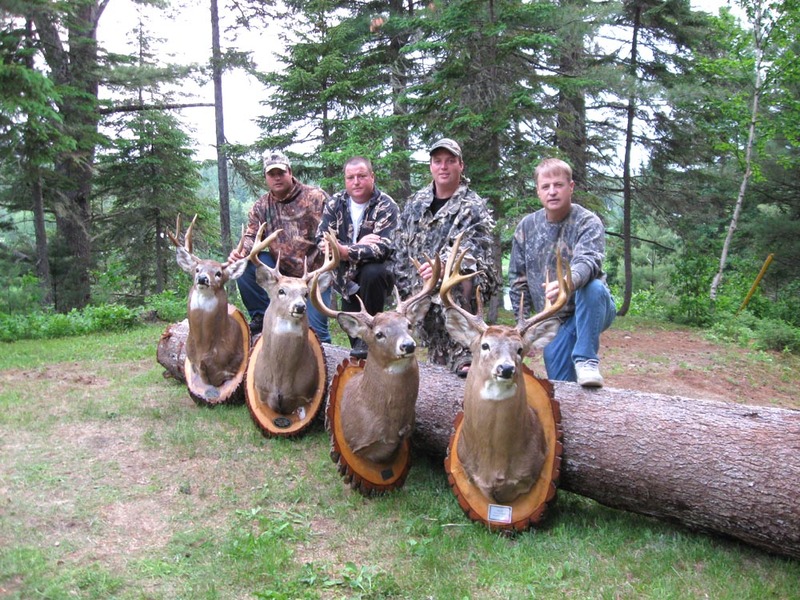 New Brunswick has a healthy population of whitetail deer but does not have the abundance that some of the other provinces in Canada do. In a way, this can work to your advantage if you are a knowledgeable and patient whitetail hunter. We can put you in a remote location where there are deer and probably when the day is done you will have not seen any other hunters. We hunt from permanent stands, portable units or ground blinds. We would prefer that you arrive at camp a day early. We will show you the area where the deer are and let you erect your own stand or blind. You can bring your favorite or we have several extra two-seaters with 15-foot ladders that you can use. Every year nice bucks scoring between 150 to 170 Boone and Crocket are taken in the zones we hunt. Note: If you are a first time hunter we can e-mail or mail you a list of what to bring. Hunting license available at camp. Upland Bird Hunts Click for information on Woodcock & Ruffed Grouse hunts.